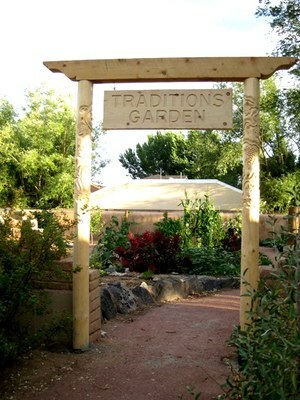 In early 2008, we created a demonstration garden at the Open Space Visitor Center that represents several early farming methods and the foods that were collected and cultivated in New Mexico. This is intended to be an educational garden where groups can actively take part in its development and observe its successes and failures. Farming methods that will be represented are terraced arroyo, waffle garden, cobble mulch garden, and orchards. A special thanks to Soilutions, Inc. for donating their locally made compost for the Visitor Center's heritage garden and teaching the local community on the how-to's of home composting.